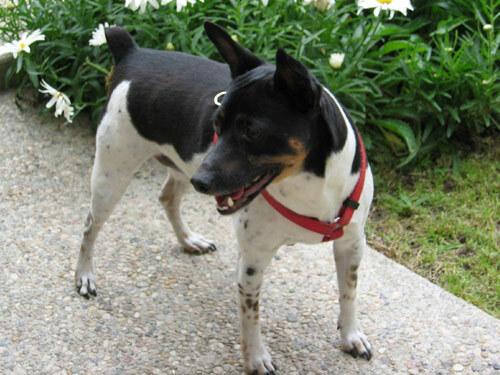 The Rat Terrier was originally named by none other than Teddy Roosevelt. The Rat Terriers were developed in Great Britain from a cross between the Smooth Fox Terriers and the Manchester Terriers in 1820. They were brought into the United States in the 1890's, where they became more popular. American breeders crossed this breed yet again with the Smooth Fox Terrier, the Beagle, and the Whippet. Breeders wanted to retain the hunting instincts of the Beagle along with the red color and the bulkiness, while the Whippet provided to speed and agility with the blue and brindle colors. The Rat Terrier can be stubborn and willful at times, and are sometimes reserved around strangers but warm up very quickly. Even with his small size, this breed is fearless and shows the true colors of a terrier. This breed makes an excellent companion for a single person home. The Rat Terrier is not recommended for the average family as he has the tendency to become destructive without proper stimulation, and also loves to roam and wander providing much stress. Spunky, energetic, lively, and alert, this breed makes a good watchdog. The Rat Terrier makes a great companion to the right family, but should be trained properly as they have the tendency to snap if frightened. This breed can do well around other pets, but should be socialized at puppy hood to prevent difficulties. Smaller animals should not be placed around this breed if they are not properly socialized around them or raised around them. Rat Terriers do not require much in the grooming area. Brushing with a firm bristle or rubber brush occasionally will remove any loose or dead hair. Baths are only necessary approximately once every six months. Bathing too often will remove the natural oils from the coat, which can cause skin problems that this breed is prone to having. The Rat Terrier should be protected from cold weather via sweaters as this breed has a very short coat and gets cold very easily. The Rat Terrier has a very short coat lying close to the body of the dog. Grooming is not a large task, however this breed should be protected from the cold via sweaters. The coat should be firm, and harsh to the touch while still remaining glossy. The Rat Terrier being so lively can be very stubborn and sometimes difficult to train. This breed requires a firm and experienced handler. Consistency is a must, as this breed tends to lose interest very quickly. A variety of techniques should be exercised to keep this dogs attention. Obedience classes at an early age are recommended by many breeds and Rat Terrier owners, however it is not required. Training can be a definite task for this alert and willful breed. A small yard should be sufficient for this small yet energetic breed. They love regular romps free, however are escape artists and should always be kept on lead or in a fenced area. This breed should be trained not to pull on lead, and does very well on long walks or jogs. Rat Terriers should have at least 40 minutes of exercise per day to avoid overeating and/or laziness, which this breed is prone to.